Kids under 15 are invited to find Waldo in Evanston as he hides in 24 independent Evanston Businesses throughout the month of July. Participants can win prizes by spotting the famous animated character at local businesses and logging their Waldo sightings in a Where’s Waldo passport, which can be printed at home or obtained at participating businesses. Find Waldo in 10 locations for your first reward; find him in 20 locations to be entered into the Grand Prize Drawing on July 31. Bookends & Beginnings will be hosting a Find Waldo in Evanston party and prize drawing at the store on Friday, July 31. at 5 PM. The event is expected to last about an hour and will include refreshments for kids and grownups. The final prize drawing includes a host of Waldo prizes and a number of other prizes from Evanston stores (check out the full list). 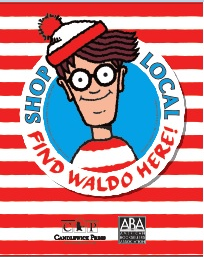 Sponsored nationally by Where’s Waldo publisher Candlewick Press and the American Booksellers’ Association, the 2015 Find Waldo Local Campaign runs throughout the month of July at indie bookstores and other locally owned businesses across the country, leading participants on a scavenger hunt through their towns’ business districts on a search for the character in order to encourage participants to shop at independent stores.